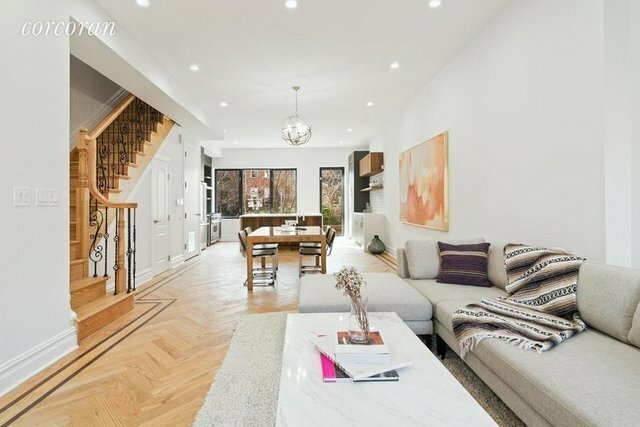 This fantastically gut renovated 20ft wide, 4-story, 2-family brownstone will captivate you from the moment you arrive to its picture perfect location on one of the best blocks in Clinton Hill. Enter the parlor floor to be greeted by a massive living/dining room with the essentials of a coat closet and half bathroom plus the delights of herringbone style hard wood floors and a wall of windows allowing for brilliant natural light and access to your private garden. The upper Owner's triplex doesn't miss a beat with 4 bedrooms, 3.5 bathrooms and 2 large outdoor spaces with both a garden and roof deck with Manhattan views. The chefs kitchen wouldn't be complete without top-of-the-line stainless steel appliances including Viking refrigerator, in addition to custom floor to ceiling cabinetry, exposed shelving and center island with bar stool seating. Just one flight up is a well laid out level encompassing washer/dryer closet in the hallway plus 3 large bedrooms, 2 full bathrooms and ample closet space. The top floor is an Owner's dream with the entire floor being dedicated to the master bedroom suite, starting with the serene sleeping quarters at the rear and a dressing room with 2 large walk in closets leading to a windowed en suite bathroom with deep soaking tub, stand up shower and dual sink vanity. Garden rental is 2 bedrooms, 1 full bathroom and occupies the ground floor and finished basement. The spacious finished basement is more than just a good place for storage with its high ceilings and washer/dryer hook up. Both units are also fully upgraded with central heating/cooling systems. 10 Monroe Street is situated among Michelin star restaurants The Finch and critically acclaimed Hart's, as well as a plethora of picturesque cafes, coop food markets and your choice of trains with the A/C and G nearby.